Made of high quality cotton and spandex, Banillue compression Arthritis Gloves are durable, comfortable and lightweight, give you the right support while allowing you to retain full range of motion. Keeping your joint & muscle warm and you can feel more comfortable while you doing the workouts! The gentle compression help reduce swelling and keep the flood moving, relieves hand tendons and arthritis pain. Speed up healing process. Open fingertips won't interfere with daily task. Excellent for everyday activities like typing, writing, gaming, sewing, crafting, cooking etc. Banillue Compression Gloves introduce new stitching technology, the gloves are even more durable and comfortable than ever. Please refer to the sizing chart in the main image setcion. ☆EFFECTIVE RELIEF FOR ARTHRITIS AND JOINT PAIN - Your hands become so hard after a whole day working, the gentle compression help reduce swelling and keep the flood moving, relieves hand tendons and arthritis pain. Speed up healing process. 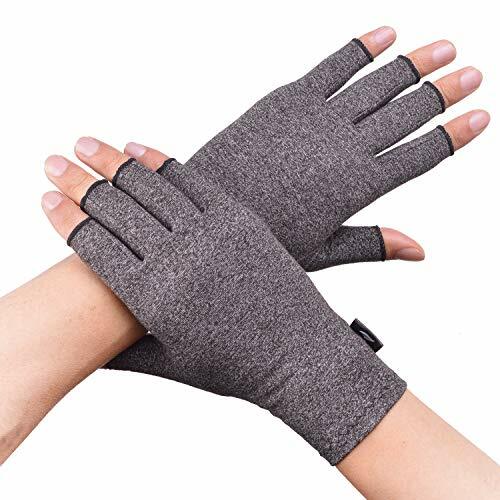 ☆ COMFORTABLE AND LIGHTWEIGHT MATERIAL: Made of 88% combed cotton and 12% spandex, Banillue Arthritis Gloves keep the hands dry and allow the skin breathe, comfortably to wear all day. ☆IMPROVED QUALITY AND COMFORT IN 2018: Banillue Compression Gloves introduce new stitching technology, the gloves are even more durable and comfortable than ever. ☆ OPEN FINGERS DESIGN: Open fingertips won't interfere with daily task. Excellent for everyday activities like typing, writing, gaming, sewing, crafting, cooking etc. ☆BANILLUE GUARANTEE: Your Gloves are protected by 90 days unconditional guarantee. Order now without doubt ! If you have any questions about this product by BANILLUE, contact us by completing and submitting the form below. If you are looking for a specif part number, please include it with your message.